Giles Hussey at practice during the 2016-2017 season. Photos submitted by Georgia State Athletics. The Georgia State men’s tennis season is looking very bright with a nice 3-2 record to start off. The Panthers would go 2-1 at this year’s Florida State University Spring Invitational, facing Mercer, Florida State and North Florida. During the first match against Mercer, Georgia State freshman Kevin Huynh would get his first win in his collegiate career in a 4-0 victory. After falling short to Florida State in a 0-4 loss, the Panthers bounced back against North Florida. 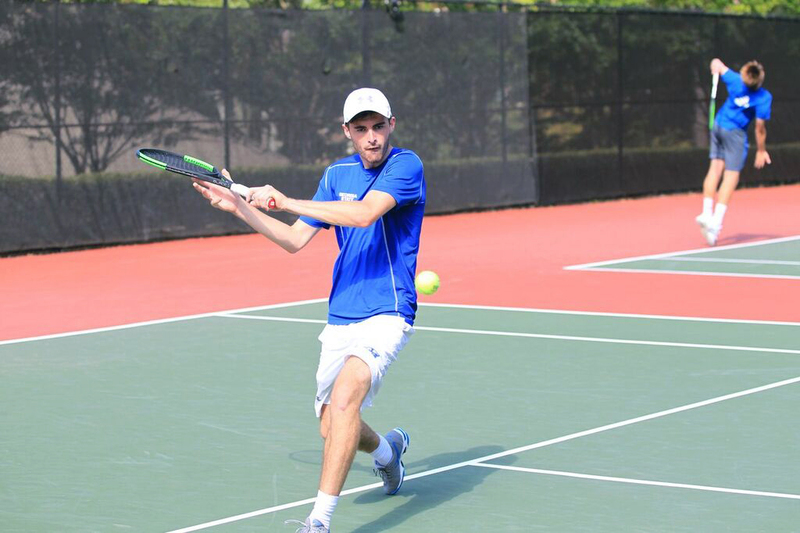 Led by sophomore Quentin Couland, who clinched the match for the team, the men’s tennis team would end the Florida State Spring Invitational with a win against North Florida, 4-0. Next, they would travel to Eugene, Oregon where they would face No. 26 Oregon and Portland on the road. The Panthers would fall short against the Oregon ducks in a 0-4 loss for their first match in Eugene. They would then make a comeback against Portland with a 4-3 win led by sophomore Quentin Couland, who clinched his second win during this road trip. No doubt exists that these guys are helping each other become successful with each match by “feeding off each other’s energy” as Coach Wolff made clear. Last season for men’s tennis was something that could have went very far. Not only did the Panthers clinch the Sun Belt championship by beating out Louisiana, Troy and South Alabama, but they also reached NCAA regionals and faced Kentucky. The Panthers would fall short against Kentucky in a 0-4 loss, but that did not keep Coach Wolff from believing in his guys. “Kentucky was a great team and was ranked high for a reason, but I feel like with the experience from last year we can learn from it,” said Coach Wolff. Georgia State men’s tennis definitely has the guys returning back to regionals with eight of the student-athletes returning this season. With the guys feeding off each other’s energies and learning from prior experiences, the Panthers seem primed and ready for another trip to regionals to not only go for the Sun Belt Championship, but for the NCAA championship as well. The Panthers will continue their season at the ITA Kick-Off Weekend on Jan. 27 in College Station, Texas. Their first opponent will be Cal Poly and the match to close out the weekend will be against the winner of Texas A&M and LSU. They look to advance to 5-2 on the season.